WATCH: Duterte confirms that he is running for President, to team-up with Cayetano - Balita Boss! Davao City mayor Rodrigo Duterte has confirmed that he will run for president of the Philippines in the 2016 elections. A short video posted by ABS-CBNnews.com on its Facebook account showed Duterte saying that the Senate Electoral Tribunal (SET) decision on Grace Poe's candidacy triggered for his will to run for the highest position in the country. "Yes, I am running," as quoted by Rappler in a phone interview. According also to Cristopher "Bong" Go, Duterte's executive assistant, in a phone call with CNN Philippines, the mayor's statement which is “The possibility of running is on the table now” in his weekly television program Gikan sa Masa, Para sa Masa, means that he will run for president. And according to Philippine Daily Inquirer news report, Sen. Alan Peter Cayetano, a vice presidential candidate, confirmed that it is a Duterte-Cayetano tandem for the 2016 elections. 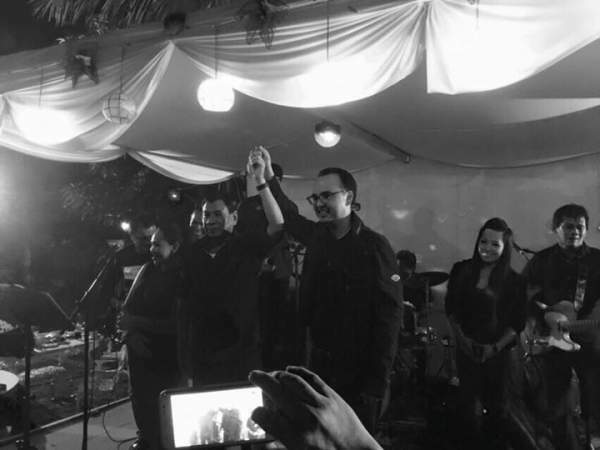 Cayetano posted late Saturday night (November 21) a photo on his Facebook page showed him and Duterte raising each others' hands with caption saying "Change is Coming! ‪#‎dutertecayetano‬‬ ‪#‎matapangnasolusyon ‬‬‪#‎mabilisnaaksyon.‬‬"
Davao City Mayor Rodrigo Duterte confirmed on Monday, November 23, that his vice-presidential running mate is Alan Peter Cayetano. “Oo, kaya nagsasama na kami (Yes, that’s why we are appearing together),” he told reporters during an ambush interview. Continue reading on Rappler.com. Vice presidential aspirant Senator Ferdinand “Bong-bong” Marcos Jr. said that it’s a clean slate for every candidate aspiring for the highest post in the country with the possible inclusion of Davao City Mayor Rodrigo Duterte in the presidential race. “If this is the final word then we can all finally end the speculation. Lahat ng surveys (all survey results are), ‘back to the drawing board,’” Marcos said in a statement. Continue reading on NewsInfo.Inquirer.net. In a statement, Poe’s vice presidential running mate Sen. Francis “Chiz” Escudero said that although he respects Duterte’s opinion, he disagrees with it. Escudero also told Duterte in his statement that the mayor does not need to hit Poe and “use the decision of the SET in her favor as an excuse to run.” Continue reading on CNNPhilippines.com.